Castle hotels near London, England. Ideas for romantic getaways. One of the Castle hotels near London – Only an hour’s drive. Leeds Castle has been a Norman stronghold; the private property of six of England’s medieval queens; a palace used by Henry VIII and his first wife Catherine of Aragon; a Jacobean country house; a Georgian mansion; an elegant early 20th century retreat for the influential and famous; and in the 21st century, it has become one of the most visited historic buildings in Britain. During your visit to Leeds Castle, enjoy the fresh air and stroll through the beautiful grounds of the park estate: The Wood Garden, The Culpeper Garden, The Lady Baillie Mediterranean Garden Terrace. You can enjoy delightful nine hole golf course, par 33, 2681 yard course was built on the 500 acre Leeds Castle Estate in 1931 by Sir Guy Campbell. Accommodation at Leeds Castle: Holiday Cottages, Knight’s Glamping, Stable Courtyard Bed & Breakfast, Maiden’s Tower Bed & Breakfast. Rising majestically from the still waters of its moat, surrounded by 500 acres of parkland and gardens, Leeds Castle is one of the most beautiful wedding venues in Kent. Leeds Castle provides a unique venue for residential and day conferences, meetings, corporate hospitality and banqueting and so much more facilities, attractions & services. One of the most romantic getaways & castle hotels near London. Dating back to the 13th century, Hever Castle was once the childhood home of Anne Boleyn, second wife of Henry VIII and Mother of Elizabeth I and formed the unlikely backdrop to a sequence of tumultuous events that changed the course of Britain’s history, monarchy and religion. One of the Castle hotels near London – only 30 miles from Central London. Its splendid panelled rooms contain fine furniture, tapestries, antiques and an important collection of Tudor portraits regarded as ‘one of the best collections of Tudor portraits after the National Portrait Gallery’ by David Starkey. Despite its splendour, Hever Castle is what every child wants a castle to be: crenellated, moated, haunted, with lots of armour and gruesome torture devices. 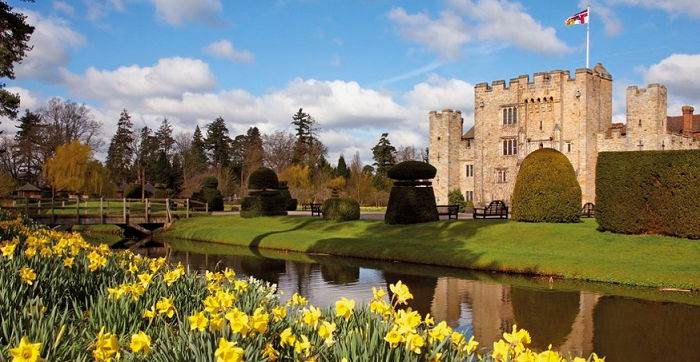 Discover magnificent award-winning gardens set in 125 acres of glorious grounds at Hever Castle. Only 1 mile from the Castle’s main entrance you will find the friendly and welcoming Golf Club. Set in the mature grounds of the Hever Castle Estate, Hever Castle Golf Club has 27 holes of golf that will encourage and inspire all golf enthusiasts. There are two venues to choose from at Hever Castle when it comes to organising a meeting, a training session or a conference, The Astor Wing or The Guthrie Pavilion. An spectacular majestic & magnificent place for unforgettable wedding in one of the most romantic castle hotels near London. A unique luxury hotel located in the picturesque village of Amberley at the foot of the South Downs. Privately owned by Andrew and Christina Brownsword, this magnificent 900-year-old castle is enclosed by a 60 foot high curtain wall and portcullis that remains open, behind which you will discover an enchanting hotel offering the highest standards of food and service. Bedrooms are resplendent with the luxurious facilities you would expect from a country house hotel. One of the Castle hotels near London. Amberley Castle is located less than 60 miles south west of London and only 22 miles from Brighton in the village of Amberley. History encompasses every part of this wonderful building and the many acres of gardens it stands in. Enjoy discovering the hotel’s tennis courts, 18-hole putting green and croquet lawn, and even the resident alpacas and peacocks roaming the grounds. Amberley Castle is an utterly unique location. 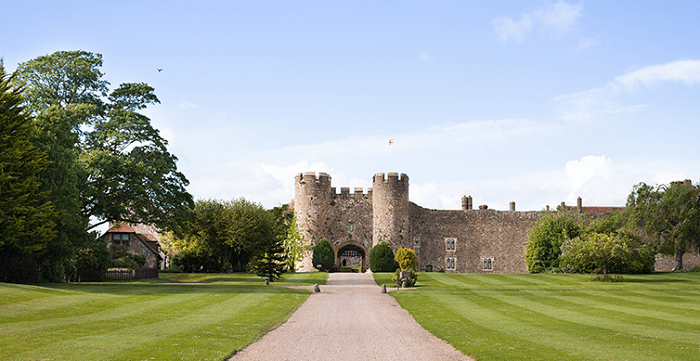 One of the greatest Castle hotels near London for romantic getaways.